My best friend Rachel lost her amazing cat Leela suddenly this September. 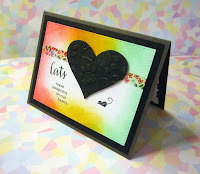 As a card maker who got her start (and kind of specializes in) making sympathy cards, I really struggled to make one unique from the other designs I have already used. The more of these cards I make -- and unfortunately there has been many -- the more I struggle to honor each individual pet with a unique card. Once I settled on a color scheme, everything started to come together. Leela was a black cat, so knew I wanted black to be one of the dominant colors on the card. But I also didn't want it looking too somber, so I ended up adding coral, amber, and a pistachio green to give it some vibrance. 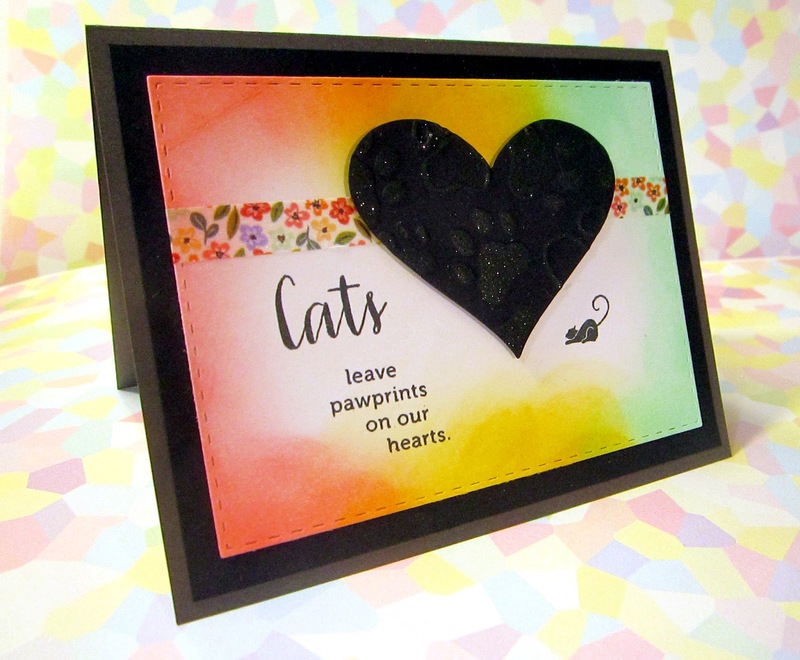 I used Distress inks to add the colors around the edges of the top panel. Abandoned Coral and Cracked Pistachio are some of my favorite colors to use for cards, but I didn't want to use just those same colors again. 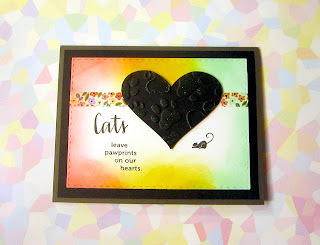 I'd already used them as the dominant colors of another card I made with this sentiment stamp set. I settled on adding yellow as kind of analogous color, to try and marry the orangey-toned coral and green colors. I found a cute floral washi tape to really connect everything together the way I wanted. 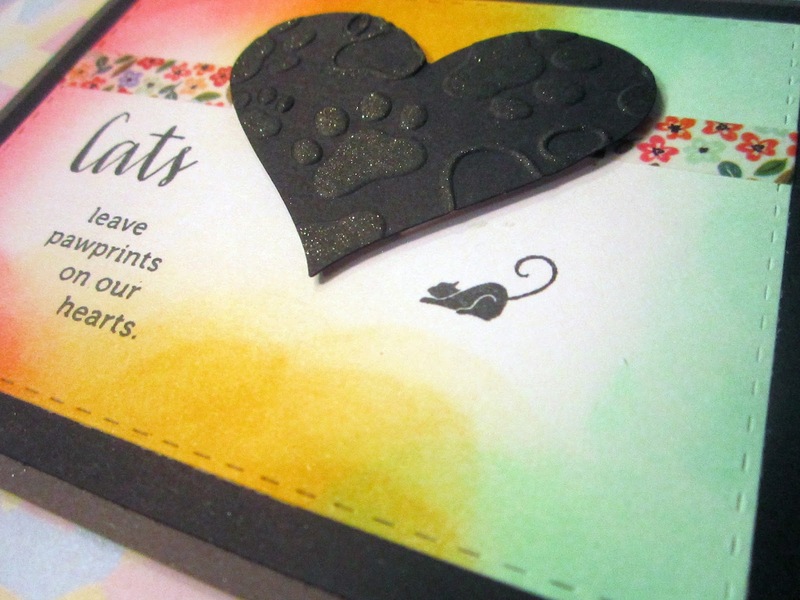 Here's a closer look at some of the ink blending going on in the corner. I'm addicted to stitched border dies. 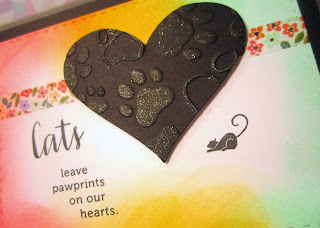 Finally, I used a gold Wink of Stella pen to add some glitter to the paw prints I'd embossed on the heart die cut. I placed the die cut raised up on foam tape. 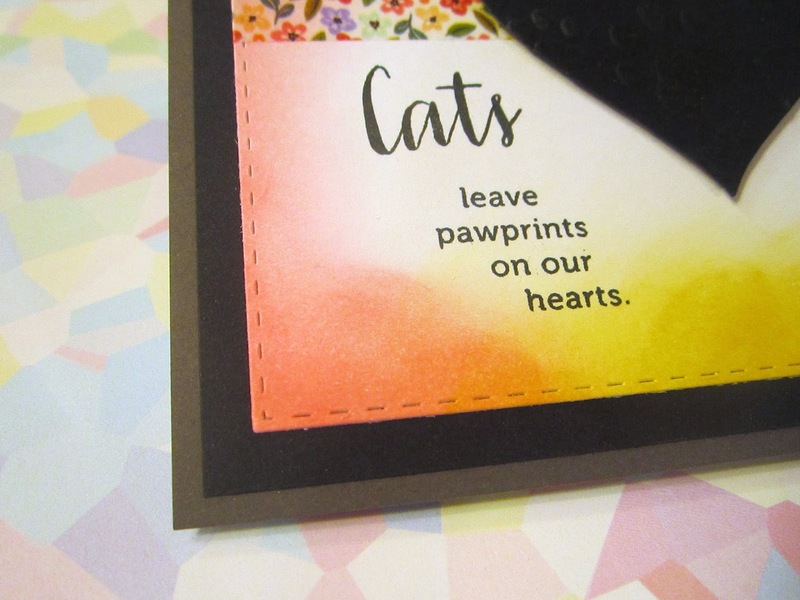 I used a peg stamp to add the black cat to (theoretically) balance out the sentiment. I didn't take a picture of the inside before I wrote my message, and I hate to share something so personal here. I deckled the edges of a sheet of Stardust White paper, which has some lovely subtle specks of color in it. I brought back in the same washi tape I'd used on the front of the card for some design unity.